1. 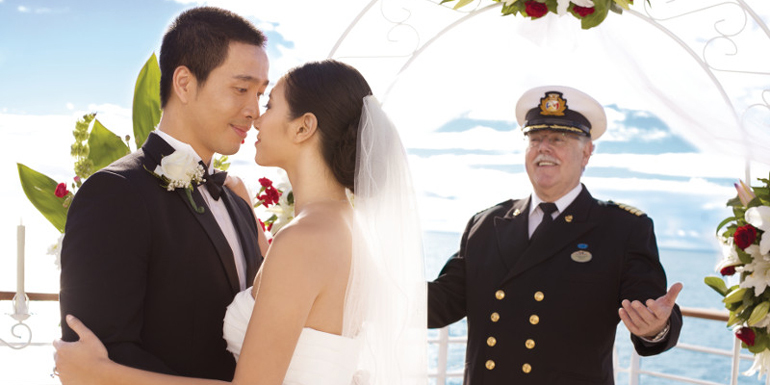 Decide whether you want a captain to perform your ceremony at sea. Though being married by a captain sounds fun, it seriously limits your choices of cruise lines, since each ship is registered to a different country with its own legal limitations. The cruise lines that allow captains to marry their passengers are Princess Cruises, Royal Caribbean and Cunard (all registered in Bermuda), and Celebrity Cruises and Azamara Club Cruises (both registered in Malta). 2. 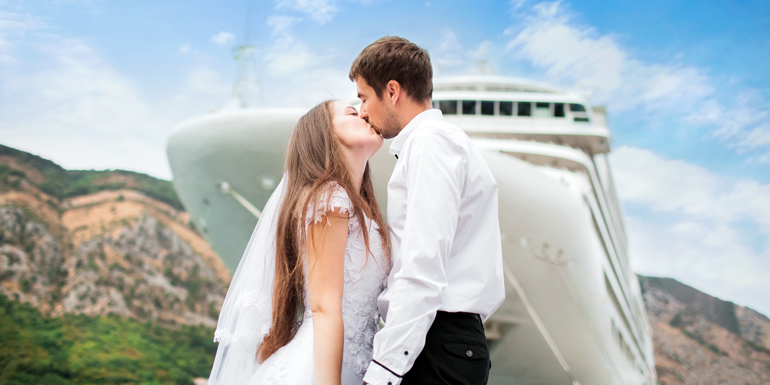 Determine whether you want to marry at sea or in a port. Getting married on land while the ship is docked at a foreign port can be tricky. Laws vary by country, and some prohibit cruisers from marrying in port by insisting on residency or even that your parents or grandparents married there. 3. Ask about additional requirements. Regardless of where you choose to get married, you’ll need to register for a marriage license far in advance, so be sure to plan ahead. 4. Be prepared to let your “type A” tendencies go. 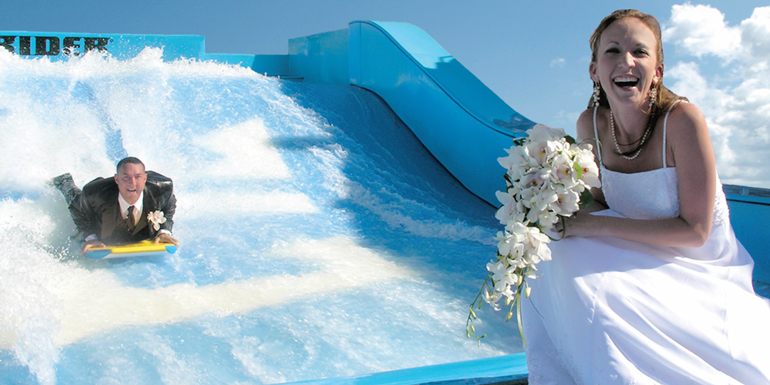 Since a lot of the cruise lines’ wedding packages offer services in bundles, your choices are more limited. If you want to have a say in everything from the flowers to the cake and the thank-you notes, a cruise ship wedding may not be the best choice for you. 5. Decide if you want to pay the extra fee for high season. Getting married on a cruise ship has become increasingly popular, and some cruise lines now charge an additional fee for getting married during peak “wedding season,” typically between mid-April and September, as well as on holidays such as Valentine’s Day and New Year’s Eve. Carnival Cruise Lines, for example, charges an added $150 between December 24 and January 4, $150 between February 11 and 18, and $100 for any date in May or June. It’s not unusual for ships to cancel calls at ports due to weather. 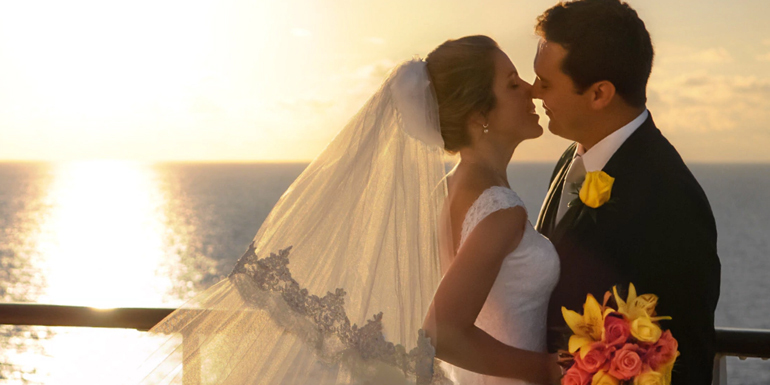 If you decide to plan a shoreside ceremony on a Caribbean island, book the cruise between December and May to avoid hurricane season, and have a “plan B” in case the ship bypasses the port you’ve chosen for your wedding. 7. Consider getting married while the cruise ship is docked in its home port. Don’t want an entourage of friends and family to accompany you on your honeymoon? Most cruise lines allow you to invite guests to board the ship for the ceremony — and, say, lunch — and then disembark before the ship sails. You just pay for the event, as well as your honeymoon cruise. It’s a nice option — you have the wedding and then sail away, waving to your loved ones from the deck. 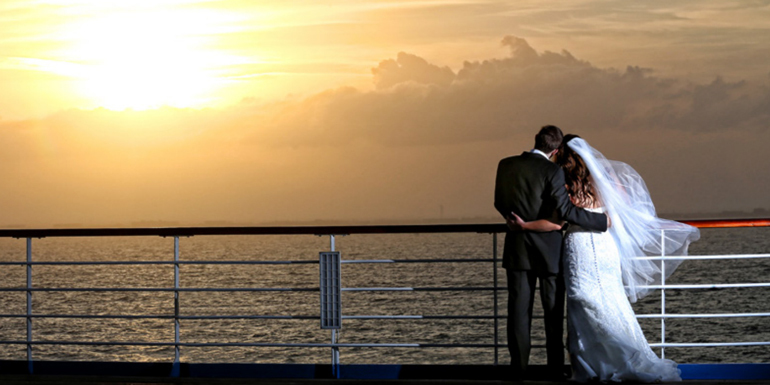 What do you like or dislike about weddings at sea? I think its important to have great staff and service with the cruise line you end up choosing. I was recently on a cruise with http://www.newyorkcruises.com/. They do parties, wedding and corporate events as well. I was there for a work event. The staff took care of everything, all the details were perfect. They event thought ahead and had cards and games to play on the boat for activities at our tables. I would highly recommend doing research and booking with a reputable company.